Summary: It was a little more difficult to preach in Samaria, because of the ancient traditions and prejudices of long standing which were expressed in the familiar words, “Jews have no dealings with the Samaritans” (John 4:9). Chapter 9 marks a distinct turning point in Acts. 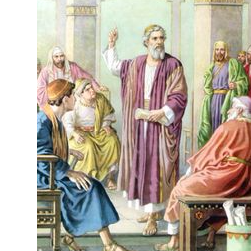 Up to now, Peter has held a position of prominence as he preached to the nation of Israel. From now on, the Apostle Paul will gradually become the foremost figure, and the gospel will increasingly go out to the Gentiles. In this chapter we begin to see the growth of the Christian Churches among those Asian cities which were largely under Greek influence. The movement seems more remarkable when we remember the antagonism between Hellenism and Hebraism. It was not difficult in some senses for Christian Hebrews to evangelize Judea. Their brethren, after the flesh, dwelt in Judea, and while it is perfectly true that they were making slow progress in it, and did not set out at all to do it until they were driven from Jerusalem by persecution, still there was no revulsion produced in their minds as they preached the Gospel of Christ through Judea. It was a little more difficult to preach in Samaria, because of the ancient traditions and prejudices of long standing which were expressed in the familiar words, “Jews have no dealings with the Samaritans” (John 4:9). But under the conviction of the Spirit, a man full of the Spirit had gone down to Samaria and had preached, and Samaria had received the gospel, and the victory had been won. But now the most difficult work by far awaited these men. Once they stepped over the boundary-line, and began to touch those ancient cities, with their Jewish customs and Greek influences, they were in a new atmosphere, and one far more difficult for them than any in which they had so far preached the gospel. We must recognize the antagonism between the two ideals. The ideal of Hebraism was that of the moral, the righteous, the religious, and it insisted upon Law. The ideal of Hellenism was that of the culture and freedom of human life, the perfection of the powers of nature, the complete utilization of all the forces of individual life. Turning to the time of Christ we find the opposing forces represented in two parties; the Pharisees and the Sadducees. The Jewish nation had become largely Sadducean. The Sadducees were Hellenists. The Pharisees stood for Hebraism. There, in the last analysis, was the conflict between the Hebrew ideal, which the Pharisee represented, and for which he fought, and for which he made his traditions a safeguard; and the Greek ideal of culture and freedom, the glorification of human life, and the denial of the supernatural, for which the Sadducee stood. This then, was the atmosphere at this time. Far beyond Judea, Samaria, and Galilee lay these ancient cities that had been Hellenized, and in the midst of them were colonies of Jews, Hellenized Jews, and it is to them that the Gospel must be preached. This introduction has been necessary to give us the background, so that we have a right understanding and appreciation of Saul of Tarsus. This man becomes the central figure in the mission to the Gentile world. His Jewish name is Saul (Paul being his Greek name); and being from the tribe of Benjamin, it is quite evident that he was named after the first king of Israel, who came from the same tribe. In the very word Tarsus there is significance. He was born there, a Hebrew of Hebrews, as he tells us in one of his epistles. Both his father and mother were Hebrews; there was no mixture in his blood. Nevertheless, Saul was from Tarsus, a Greek city, the great university city of that time. He received his early religious education from his father and mother, Hebrews, not Sadducees, but Pharisees. This man, born in Tarsus, received his earliest and mightiest impressions in the atmosphere of Hellenism. At about fourteen years of age his parents were determined that he should not be educated under the Hellenizing influences of Tarsus; so they did not send him to the university there, but to Jerusalem; and he was brought up at the feet of Gamaliel. Being a descendent of Hillel, Saul’s teacher naturally followed the more liberal tradition in Judaism. This was a wonderful merging of life styles and philosophies; undeniably a coming together of opposing forces. The boy had spent his childhood in a Greek atmosphere, and had gained his earliest impressions there, the impressions that will stand for a lifetime. This man, a Hebrew of Hebrews, a Pharisee, was also a Hellenist. Greece had touched him with its culture, its refinement, its poetry, and all its glory; and his zealous, godly, and much to be reverenced teacher, Gamaliel, was utterly unable to eradicate the poetry and passion of Greece, because he had been too long in Tarsus. He was generally regarded by the rabbi’s as one of the most promising young men in Judaism. As for zeal, he outstripped all his fellow Pharisees and Rabbis. He was a Roman citizen, a right he inherited from his father (Acts 22:8), and we will observe later that on occasion he appealed to his Roman citizenship in a crisis. It was a little more difficult to preach in Samaria, because of the ancient traditions and prejudices of long standing which were expressed in the familiar words, “Jews have no dealings with the Samaritans” (John 4:9).